Musical pun fully intended! 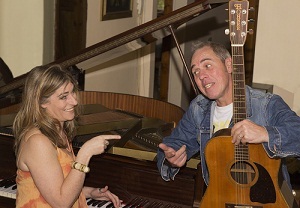 Durban musicians Barry Thomson (guitar and vocals) and Calli Thomson (piano and vocals) present an intimate and funny musical show at Tina’s Hotel at Kloof this weekend. Thomson Verses Thomson consists of duets that they’ve sung and played in shows and bands over the years together, as well as songs that have influenced their lives. Enjoy entertaining stories about how things actually happened. The show includes a couple of clever mash medleys portraying conversations – and arguments - between couples in bands and couples in real life, too! Both are no strangers to the Durban music and theatres scene having played in many shows together at the Heritage, Barnyard, Catalina and Sneddon theatres such as The Guitar That Rocked the World, Unplugged, Johnny Plays Guitar, Forever Young, Rock me Amadeus, La Vida and 80’s tribute show Alive and Kicking. Barry’s shows include Taste of Thomson and tribute shows to Dire Straits and The Eagles, The Jazz Singer (tribute to Neil Diamond), Rock Legends, More Than a Feeling, his solo acoustic show Up Close and Personal and most recently Woodstock at The Rhumbelow. Calli has been musical director, and band member of numerous shows at the Barnyard such as Glory Days, Rock Around the Clock, Walking in Memphis, Your Momma Don’t Dance, Celtic Rock, Natural Woman, Hollywood Rocks, Rocking all Over the World, Big Band Magic, Viva Las Vegas, Elvis Forever, Broadway Rocks, Route 66, LM Radio, Diamonds & Pearls, 99 Hits, Those Were the Days, Thank You for the Music and 50 Carat Gold. Artists featured in Thomson Verses Thomson include Don Henley, Stevie Nicks, Shania Twain, Kate Bush, Kid Rock, Cheryl Crow, Sting, Supertramp, Barbara Streisand, Neil Diamond, Bryan Adams and Bonnie Raitt. Tables seat 6 at Tina’s. Tickets R150 pp (R130 pensioners & FHSSC Members). Booking is essential for Tina’s Restaurant as seating is limited – contact 031 764 7843. We recommend that you arrive no later than 90 min before show time for the Restaurant.